- White and red paints contain low halogens. 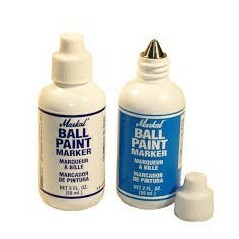 - Marks with real paint, dries in 5 minutes. - Durable metal ball tip marks on wet, oily, smooth and rough surfaces; including metal, wood, plastic, glass and any hard surface. - Unbreakable plastic bottle with 3mm steel ball tip. - Temperature range: -46°C to 66°C. - Other colors like blue, green, black and orange available on inquiry.